Join Sara Campbell, Kundallni Yoga teacher, freediving coach, and one of the deepest women in the world, on an exploration of freediving as a spiritual path and practice. This year's event, TRAINING & PERFORMANCE is the fourth in the series of Sara's Yoga for Freediving workshops. And we invite you to explore this journey with us, at the amazing Nemo 33, in Brussels this August/September. For more information or to confirm your place on this amazing weekend, please email Dominique De Troyer at Happy Freediver Inside. With the water as your teacher and world champion freediver and international yoga teacher Sara as your guide, this is a powerful combination to both improve your freediving technique, and take profound steps in your personal journey of self-awareness and freedom through the magical world of Yoga for Freediving. 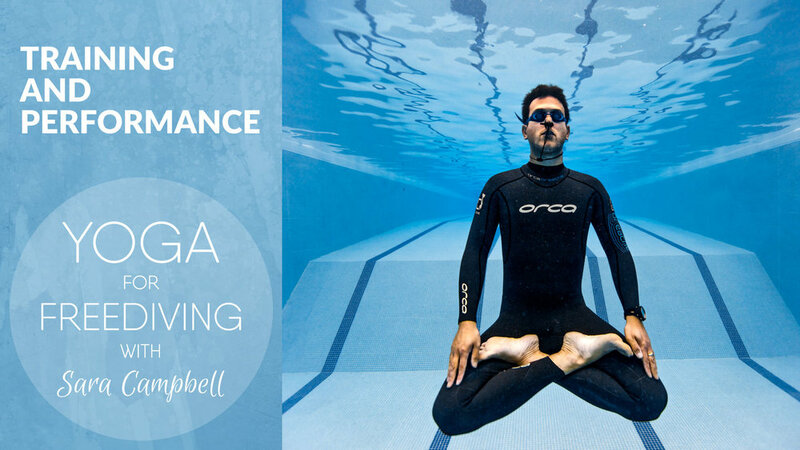 This programme is open to all freedivers, from all backgrounds, all ages, and with all levels of yoga experience (including none at all!). Basic confidence in and around the water is helpful, and a minimum freediving certification level is a must. It is not possible to train successfully based on meditation, or technique, or stamina alone. The Laws of Nature come into play in everything that we do, including the law of adaptation, which governs how the human body can be safely and successfully stimulated to adapt to all kinds of change. In freediving we need to adapt to decreasing oxygen saturation levels, increasing carbon dioxide levels, pressure at depth, the body's ability to work anaerobically, specific strength and flexibility and many other things. The mind is not separate from this adaptive process. For freedivers, TRAINING & PERFORMANCE is essential as it is this course, possibly more than any other, that addresses the internal battle that so many face when confronted with the desire for greater performance, but faced with the very uncomfortable reality of a squeeze, black-out, or physical or mental burn-out. TRAINING & PERFORMANCE paves the way for a radical re-think of your training strategy to help you move from stress to 'yes'! It leads smoothly into the next course, Success and Failure, to dig deep into our psyche to understand how our underlying beliefs drive us towards unsupportive and even unhealthy or destructive behaviour. TRAINING & PERFORMANCE is about training in balance and harmony, to always connect with the joy in what we do, and how we do it. Once we receive your deposit, you will receive FREE ACCESS to Sara’s complete Yoga for Freediving TRAINING & PERFORMANCE online training programme (over five hours of amazing freediving and yoga wisdom) so that you can continue to build on the work you will do through this weekend experience. Please email Dominique De Troyer before 28 February 2019 to confirm your place on this amazing weekend freediving experience or if you have any questions. ONLY 20 PARTICIPANTS.